Panopto is a Leader for the fourth time in a row. Video content management systems are transforming the way that organizations use video, from creation and curation, to storage and streaming, to searching, sharing, and more. 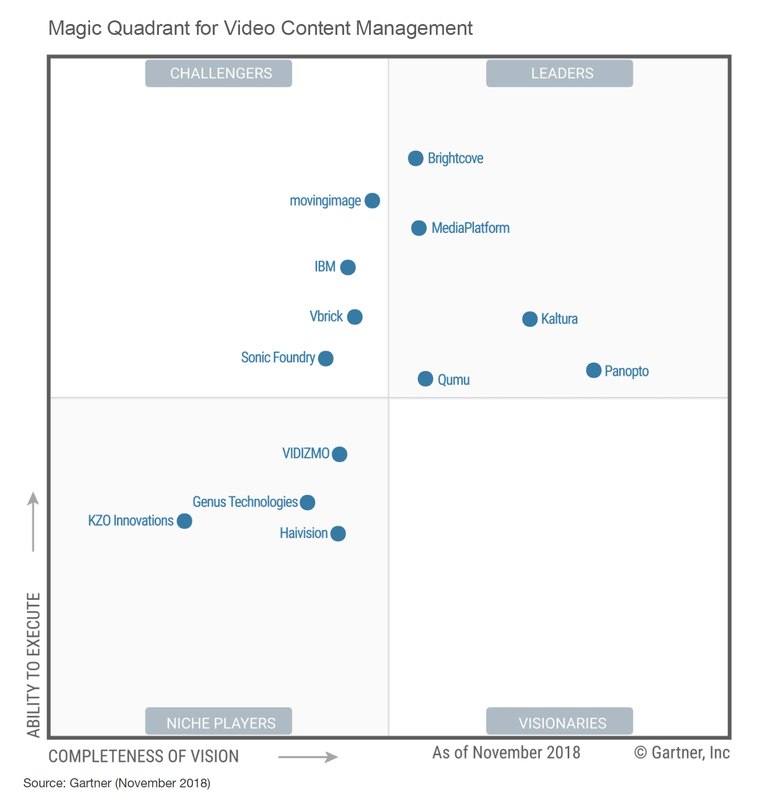 In the firm’s 2018 Magic Quadrant, Gartner provides an independent evaluation of enterprise video content management vendors. The Magic Quadrant is widely recognized as one of the most influential market analyses, and as a “Leader” in the report, Panopto is pleased to offer complimentary access to this research. Fill out the form on this page to access the report. Gartner does not endorse any vendor, product or service depicted in its research publications, and does not advise technology users to select only those vendors with the highest ratings or other designation. Gartner research publications consist of the opinions of Gartner’s research organization and should not be construed as statements of fact. Gartner disclaims all warranties, expressed or implied, with respect to this research, including any warranties of merchantability or fitness for a particular purpose. This graphic was published by Gartner, Inc. as part of a larger research document and should be evaluated in the context of the entire document. The Gartner document is available upon request from Panopto. GARTNER is a registered trademark and service mark of Gartner, Inc. and/or its affiliates in the U.S. and internationally, and is used herein with permission. All rights reserved.